I have said time and again that this past summer was stimulating and educational for us, but I know as a blogger that my passions may not match yours so if geology isn’t your thing, feel free to look at the pretty pictures instead. I say this as someone who gave geology a mere passing nod until I supported a couple of naturalist courses on the subject. Now I am spellbound and will never look at Yellowstone the same, nor anywhere else for that matter, where geologic forces come together to create majestic peaks, valleys, and canyons. I can’t say which of the Yellowstone Forever field seminars I supported was my favorite, but without a doubt I can say that the instructor who led the Thermal Biology and Geology course this summer, Joshua Theurer, is extremely bright, passionate about Yellowstone, and can hold a student’s attention like the most seasoned of instructors. I was fully engaged in both his field seminars I supported and look forward to participating in more of his classes in the future. Cistern Spring, which drains when Steamboat Geyser erupts. This spring grows more in one year than most do over 100 years – 1/16″. Joshua’s “Observing Thermal Geology and Biology” course, which followed on the heels of Virginia’s “Landscape Geology” class (also wonderful), was fortuitous for me (or so I thought), giving me a leg-up, as it were…hardly. This is a complex subject, and we were required to complete an exercise before the end of the course, in order to receive credit for this naturalist class. I could go on and on about everything I learned but instead will touch on some of the highlights, so as not to put anyone to sleep. The outer layer of the earth, the crust, is analogous to the shell of the egg. It is ~ 25 miles thick. Yellowstone has a much thinner crust than average, as little as three miles thick in places. The mantle, which makes up the bulk of the earth and moves in enormous convection cells, is like the egg white. It averages about 3000 miles in thickness. The core of the earth, resembling the egg yolk, is composed mostly of metals and acts as a nuclear reactor, our primary heat source. 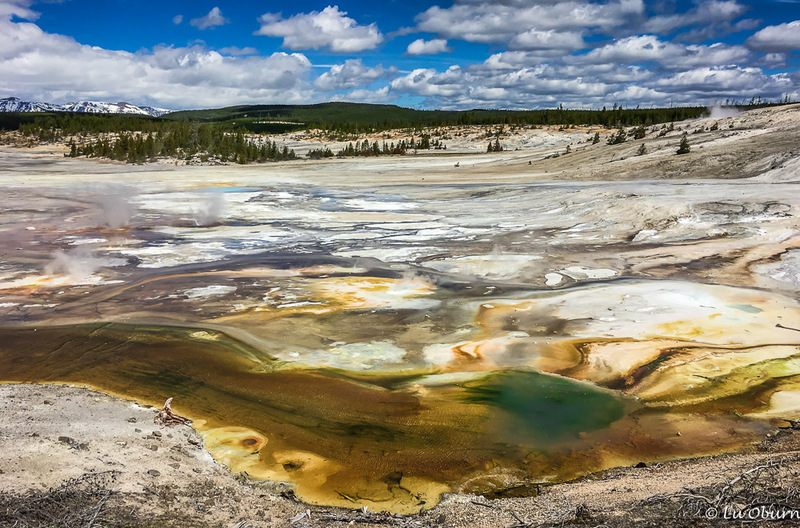 There are about two dozen hot spots on earth, with Yellowstone being one of the largest. The theory is that a hot spot originates at the core of the earth and doesn’t move. The continental plates move across them. 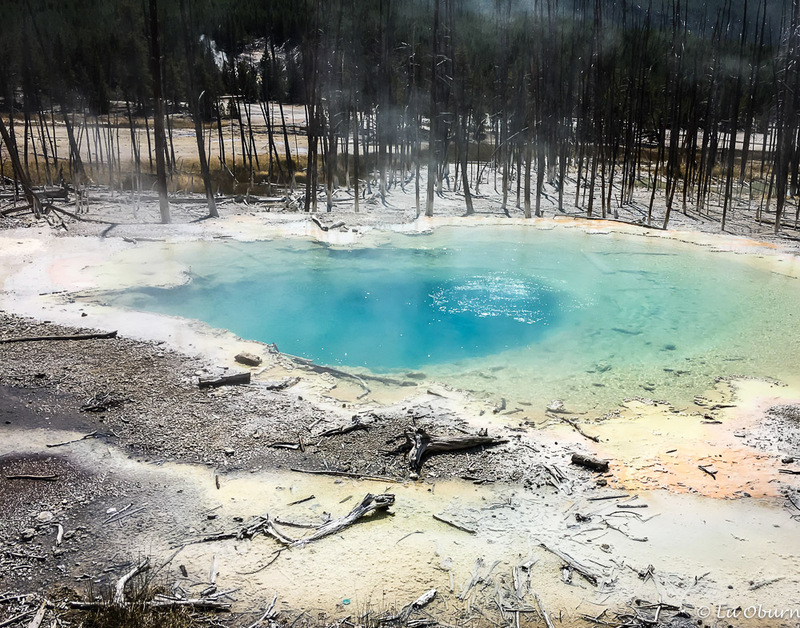 Given the 10,000+ hydrothermal features in Yellowstone, one would assume a significant magma chamber below the park, deep in the mantle of the earth, and you would be right. In 2011 the University of Utah’s research concluded that this chamber was at least 400 miles thick and this was all they could determine as their equipment went no further. In 2015 they discovered a “mantle plume” of roughly 1000 miles below the original magma chamber, a reservoir 4.5 times larger than their initial discovery! We now believe there is enough magma below Yellowstone to fill the Grand Canyon 11 times. Although this sounds ominous, given Yellowstone is classified as a “supervolcano”, scientists don’t expect a major eruption is in the park’s near future, and feel that there would be weeks, if not months, of increased seismic activity prior to such an eruption. Echinus Geyser, the largest acidic geyser in the world, and one of the most popular in Yellowstone. Day one our course took us to one to the hottest and most rapidly changing thermal areas in all of Yellowstone – Norris Geyser Basin. Mechanically it functions like other geyser basins but is far more complex, due to the converging of three fault lines beneath it. Porcelain Basin resides within Norris and was so named for the milky color of the mineral deposits found here. Hot springs – most common and have no constrictions. Water continually circulates, preventing the water from reaching a temperature needed to produce an eruption. The deeper the blue color, the hotter the water. 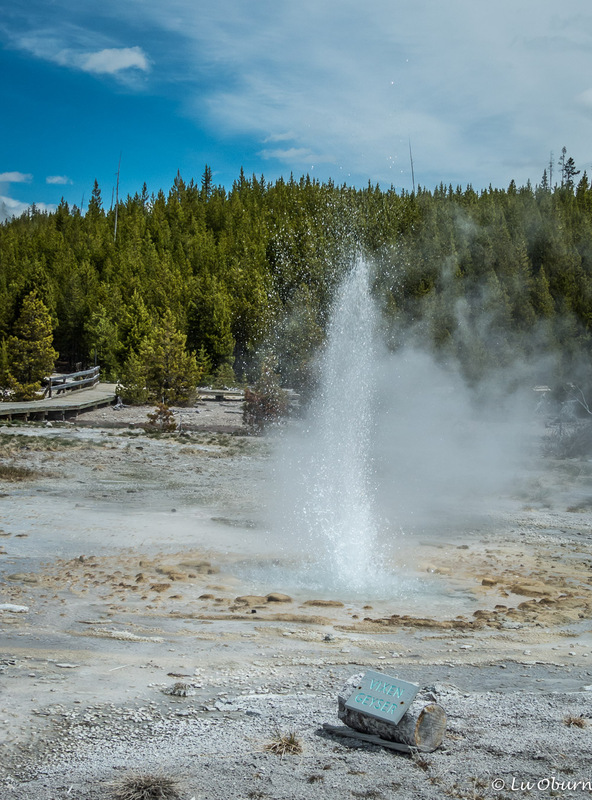 Deep blue signifies temps of at least 159º F.
Geyser – around 500 in the park. These features erupt when the gas bubbles’ surface area is so great that the water is lifted outside the reservoir. Mudpot – most acidic, with a pH of 2 or less and a limited water supply. Gases convert rock to clay. 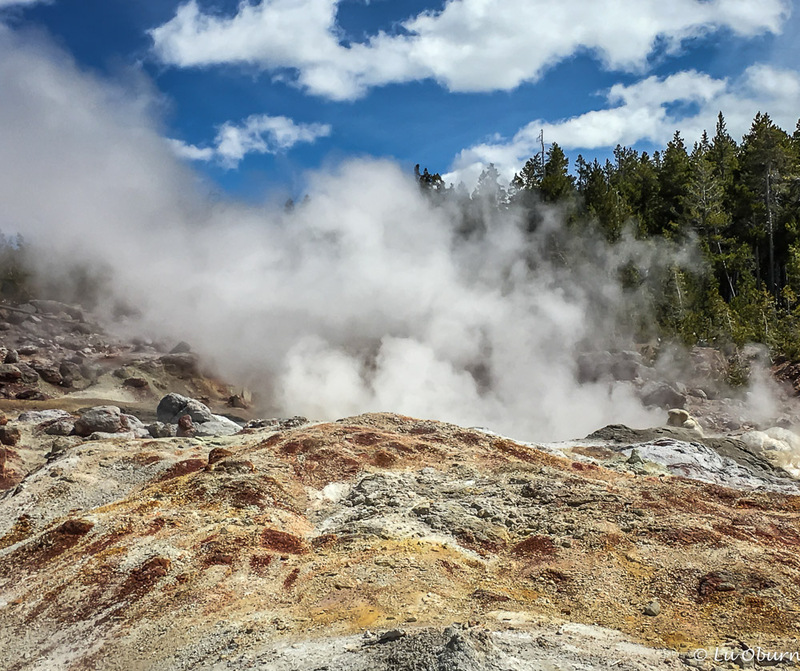 Fumarole – known as a steam vent, and is the hottest hydrothermal feature in the park. Water is converted to steam even before it reaches the surface, and is usually announced with a loud hissing sound. Temperatures can reach to 280º F. Norris’ hillsides are dotted with these steam vents. 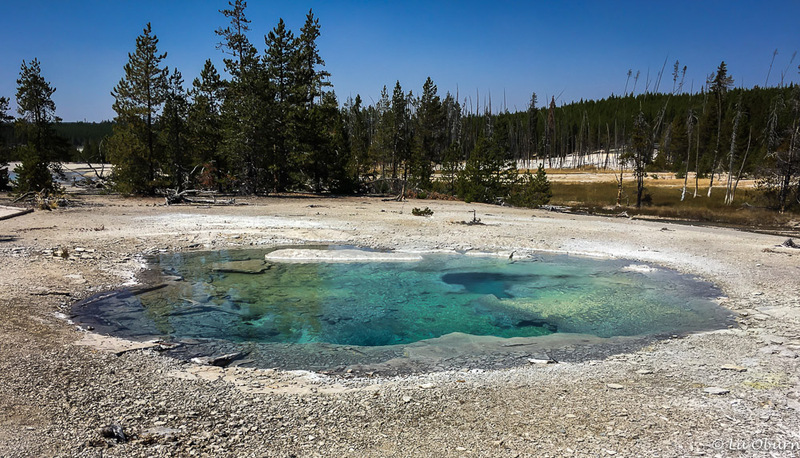 Hot springs, geysers, and fumaroles can be found within the Norris Geyser Basin. I am not aware of any mudpots within Norris, but some can be found just a few miles south at Artists’ Paintpots. 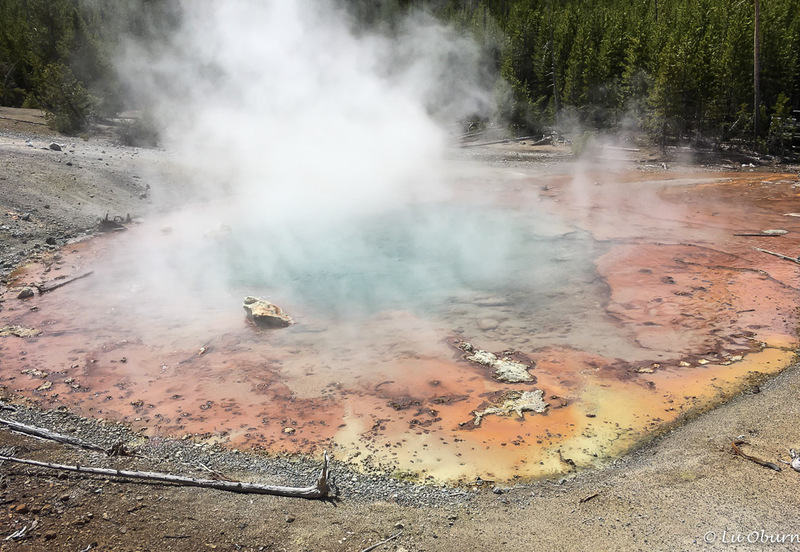 The varying colors found within these thermal features are due to special microbes, called thermophiles, that make their home here, and the off-putting smell (think rotten eggs) is due to the elevated levels of sulfuric acid and hydrogen sulfide gas found in the thermal features. 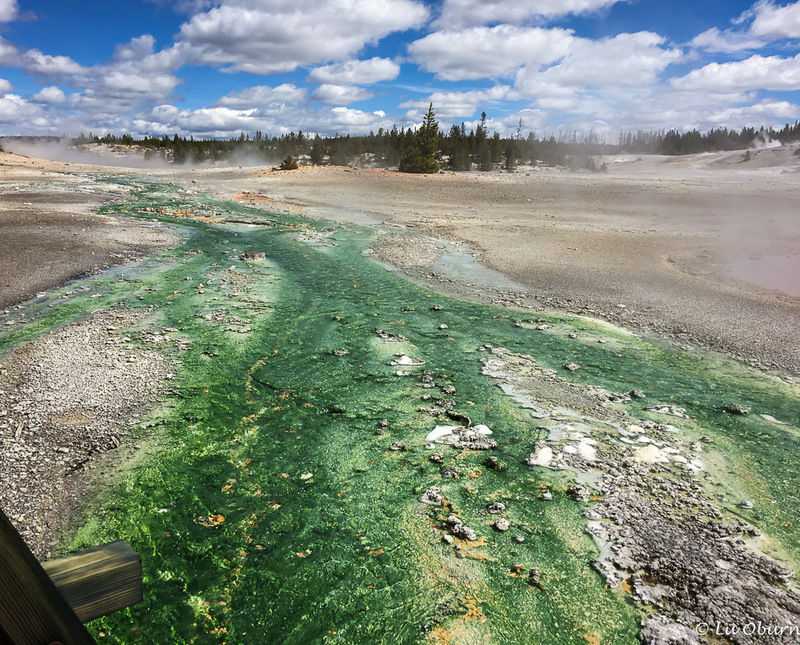 Thermophilic algae, known as “Cyanidium” create the bright-green color seen in this area of the Porcelain Basin in Norris. Temperatures here average about 120º F, with a pH of 3-4. This organism can be found nowhere else in the park. Vixen Geyser, a sassy little gal, who is very active. Next Up: Day 2 of Thermal Biology, where travertine abounds. Thanks for the science lesson! Looking forward to the next one. Although not as pretty as some of the more colorful thermal features in Yellowstone, for some reason I found the mudpots to be especially fascinating. I find it all to be fascinating! And the idea that those mudpots are created by the breaking down of rock into clay just boggles my mind. That reminds me of the Geysers of Iceland, I have seen. Seeing one erupting is the best, but still seeing them boil is great too. Nature is so amazing. The biggest and most active one in Iceland was erupting every 4 minutes and it was hard to get away form it, as you keep wanting to see the next eruption. I loved it. I can imagine it was amazingly interesting. Hello Ute! The geysers of Iceland are on our travel list, so hopefully one day we will get to experience them. Nature is so fascinating! Fascinating info and photos! Geysers are such interesting natural phenomenons! Great pics! OMG! This is such wonderful information, and your pictures are perfect. I can see why you have been so excited about this summer’s adventures in Lamar Valley. I hope you do go back next year, because I would be excited to see more of what you learned. Thank you for sharing!!! This is fascinating stuff LuAnn! And fabulous photos. I have witnessed a bit of geothermal activity in Japan, and recently in the Azores where much of their electricity needs are apparently met by geothermal power plants, but nothing on this scale. Thank you for sharing. My pleasure Madhu. Your travels have been much more exotic than ours, which is why you are one of my travel idols! We hope to turn our attention more to traveling beyond our borders. Such a fascinating world out there to explore! I am fascinated by geology, this course sounds amazing! So much of the southwest is covered with incredible geologic formations…very, very cool that you got an in depth lesson. I found all the courses that I supported to be fascinating Lisa. Yellowstone Forever has designed a Yellowstone Naturalist Certification program, which requires taking 7 naturalist field seminars, over whatever period of time you would like. I was able to support/attend the 4 that were given this past summer. I hope to get this certification some day. It would allow me to support work in the park through the NPS. Oh how we love Yellowstone. I think Paul and I would have both loved taking that course. We are so very blessed to be able to enjoy God’s gifts. How he thought of making all this beauty for us is amazing. You have a way with photos to bring out the beauty in everything. The way you captured all the colors in the geyser basins is fantastic. I am with Gayle. I, too, like the mud pots. Thanks for a super science lesson. Helps me to understand the inner workings of these Fire and Ice beauties. Love this post!! I think most people have so little time in Yellowstone that there is little to no reading about the features. I thankful that our various visits afforded us the time to really read and learn. It is amazing how varied the features are in Yellowstone. Your header is probably my favorite spot in the park. I understand the park has finally created a place to legally way to view the Grand Prismatic Spring from above!? We hiked a trail we discovered and then climbed a VERY steep hill over a thousand dead tree trunks to see it from above. We almost killed ourselves but it was worth it. I understand that trail was closed and you were ticketed for trying it shortly after our trek. It is such an amazing site! Thanks for refreshing my memory:) Can’t wait for the next post!! Thanks Pam! I find the hydrothermal features fascinating and to learn that there is a much larger magma chamber sitting below Yellowstone than anyone ever suspected just blows my mind! You are right, there is now a wonderful path that allows visitors to view Grand Prismatic from above. The lookout point that has been created is wonderful. My header shot was taken from this lookout. I had heard about how challenging that climb was before the lookout was built. We never tried to tackle it when we lived in Yellowstone. It is pretty sweet now. Amazing post LuAnn. It is unbelievable to think of how the earth works. So incredible. I’d love to bring my kids to Yellowstone someday. I went as a child and was amazed by it. Nicole, I think everyone should experience Yellowstone at least once. There is so much diversity. We had not been to Yellowstone until later in life, when we lived in the park for two years. The winters especially are amazing! Thanks for the course, Lu. And the pictures were wonderful. All that blue sky. What planet is Yellowstone on? My pleasure David. Those Montana big skies are pretty special. Yellowstone is otherworldly, isn’t it? This is the granddaddy of hydrothermal features, Grand Prismatic. The photo was taken early in the season, so thankfully not as many tourists. You really captured Yellowstone! Gorgeous captures of an amazing place! Those Hot Springs are something to see! Aren’t they?!?! It’s been a few years for me since I have been there. So thanks so much for the sweet memories! My pleasure Nancy! Yellowstone is indeed an amazing place. I’ve been to many of our national parks (my parents took my brothers and me camping almost every summer, and my love of them has continued into my adulthood) but I’ve never been to Yellowstone. Your geology/history lesson, and especially your beautiful photos reinforce my commitment to get there one day soon. Just amazing. We too are enthralled with our national parks and have many favorites. I have a particular passion for Yellowstone as it is our first NP. Thanks for stopping by! What a diverse learning experience you had this summer LuAnn. I’m not a real geology fanatic but oh my the areas you went to and the photos are jaw dropping. Thanks Sue. I was not a geology buff either until I supported two of the classes this past summer. The thermal geology class really drew me in. Now I need to go back to Yellowstone with your blog post printed out as a guide! Your analogy of the earth as an egg is really helpful. We spent 10 days exploring Yellowstone a few years ago, and I think the Norris Geyser Basin was my favorite area. I’d love to see Grand Prismatic from the new trail. It sounds so much easier than the old, where I couldn’t get any decent photos! Your photos are wonderful! Very interesting way of learning something new. Thank you for sharing!